This mural project was funded by Jennymount Methodist Church Belfast, in partnership with local community arts organisation Arts For All. The mural decorates the creche and was commissioned as part of a project to completely rebuild the church following its total destruction by an accidental fire. 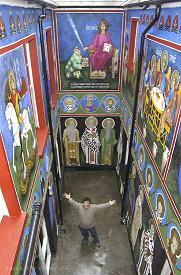 This mural project was funded by the Naughton Gallery in partnership with QUB Institute of Byzantine Studies. 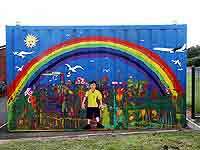 The picture shows Colin celebrating the completion of the mural. 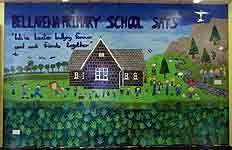 This mural project was funded by Lisburn Borough Council in partnership with the Colin Glen Trust. 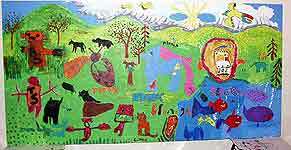 The pictures above are from the sessions with children from local Primary Schools during spring/summer 2002. 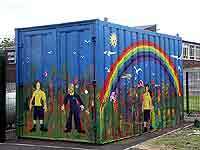 This mural project was funded by Magherafelt District Council. 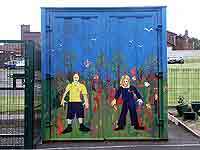 The pictures above are from the sessions the artist facilitated in the town with children from St Johns Primary School during October/November 2002. 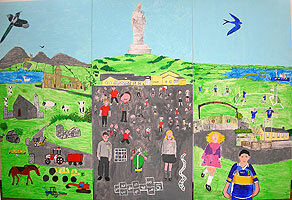 The mural painting features the childrens interpretation of local images including wildlife, a standing stone and the 3 main churches in the town.